Garage doors have been a common part of the home for so long that it can often be a little difficult to imagine what life was like before their inception. With a history that goes back even further than any of the cars they were designed to protect, many people are completely unaware of their humble beginnings. These days we can get automated systems that open up when you drive up to them, laser guided parking assistance, Wi-Fi compatibility and remote controls. But before all of these fancy technological advancements came about, things war far from complex. Long before there were motor powered vehicles around, society's elite rode around in horse-drawn carriages. These carriages needed a place to be kept safe from intruders, but more importantly, they needed to be kept out of the harsh weather, which would damage them over time, particularly in London, where the weather is almost always miserable and damp. And so the first garages were conceived. Called gatehouses back then, these storage facilities were built in popular areas where people could store their carriages while they were out and about. But it wouldn’t be until many years later when there would be a need for them to be installed in residential homes, so that they could be kept safe on their owner’s own property, and it was around about the same time that electric openers were conceived. A long while later, a man named C.G. 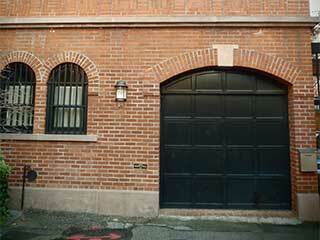 Johnson discovered that a garage door could be opened with far more ease by automating it with a counterbalance system, and so he invented the first ever automated door in 1921, and so his company, the Overhead Door Company began producing them to meet an ever-growing demand and popularity for their product. This sparked somewhat of a revolution in the average home, as the American dream was to have a place of your very own with a white picket fence and an automated garage door. As the invention’s popularity grew, so too did Johnson’s competition. It seemed that new types of electric openers were popping up everywhere. It didn’t take long before you couldn’t throw a stone without hitting a garage door service provider who could automate your residential system. This, in conjunction with the automobile boom thanks to Henry Ford, cemented garage door as one of the prerequisite parts of any proper home. Once the ball got rolling it was all steady progress from that point on, and it seemed like every year brought a new collection of features to automated systems. Nowadays you can get universal remote controls, Wi-Fi and smartphone compatibility, backup batteries, motion sensors and a lot more innovations coming every day. Who knows what they'll think of next? One thing is certain, though, no matter how much they change, automatic garage doors are here to stay. If you find yourself in need of some professional assistance, give our team at Garage Door Broken Spring Orlando a call.